Red velvet cupcakes — who doesn’t love them? Moist and velvety, just like their name, with a subtle flavor of cocoa that isn’t as rich as chocolate fudge, they are a grown-up favorite. Plus the deep red color is a perfect Autumn snack. This recipe is altered from Martha Stewart’s recipe, with less sugar and less oil. 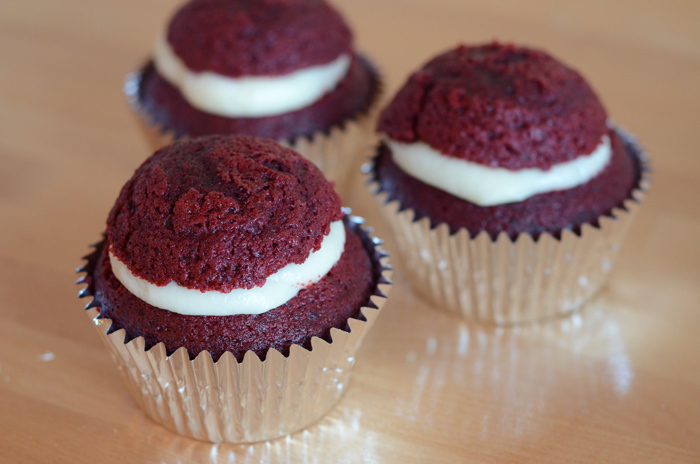 I think they are perfect with the cream cheese frosting, but if you want to skip the frosting you could increase the amount of sugar in the recipe. Preheat the oven to 180C/350F. 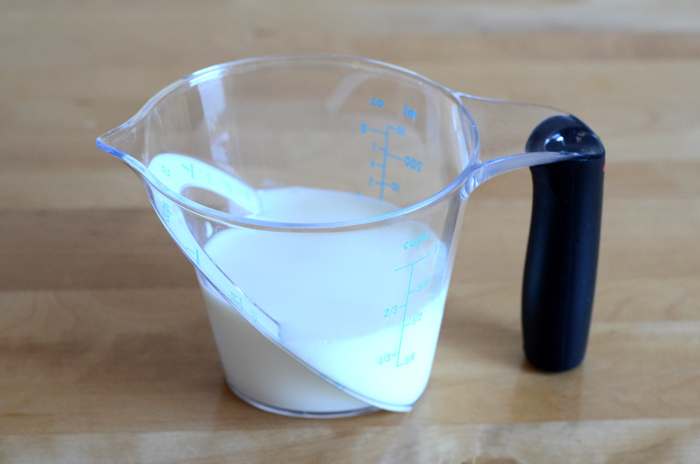 If you don’t have any buttermilk handy, or like me if your local supermarket doesn’t stock any — you can make a substitute by putting 1/2 tbsp vinegar into a measuring jug, topping it up with milk (I used 2% fat) up to the 1/2 cup mark. 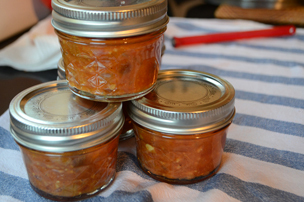 Let it sit in the fridge for at least five minutes before use. It’s not exactly like the stuff you get in a carton, but it does the trick. 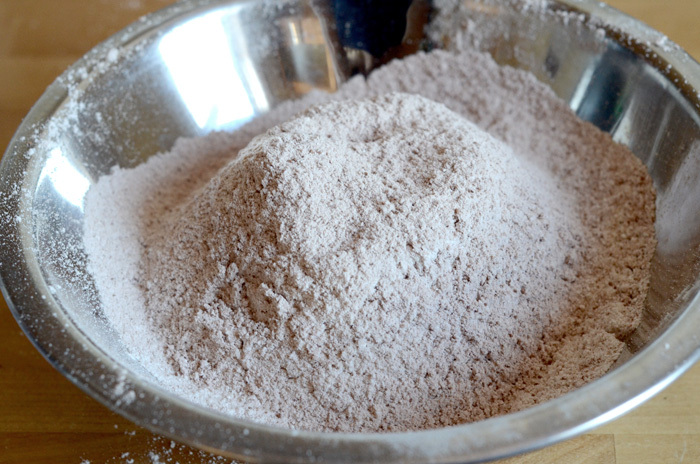 Measure out the flour, cocoa and salt and sift them together until well incorporated. I sifted it twice to be safe. Whisk the sugar and vegetable oil well, add in the egg and mix well. 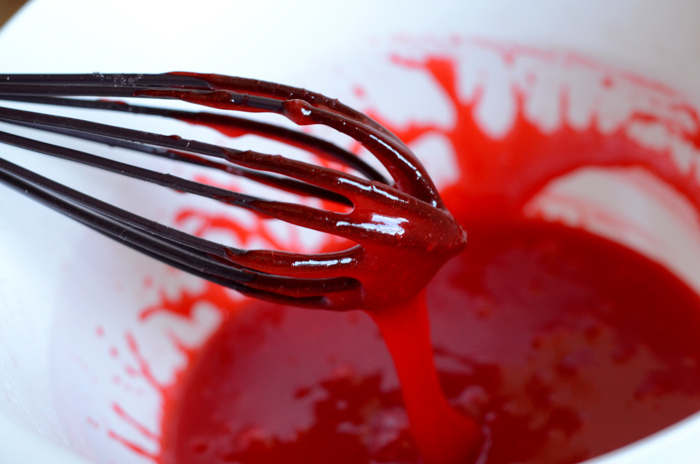 Add the food coloring and enjoy cooking up bright red goo like some sort of witch! To the sugar mixture, add 1/3 of the flour mixture, followed by 1/2 cup buttermilk and repeat until everything is well mixed. 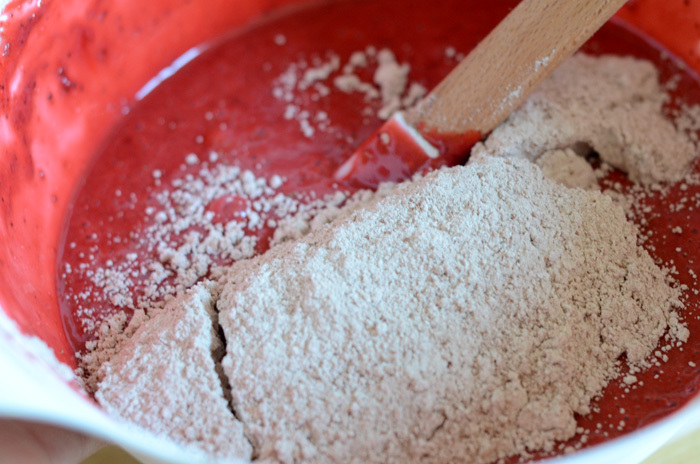 At the very end, dissolve baking soda into vinegar and mix well into the batter. 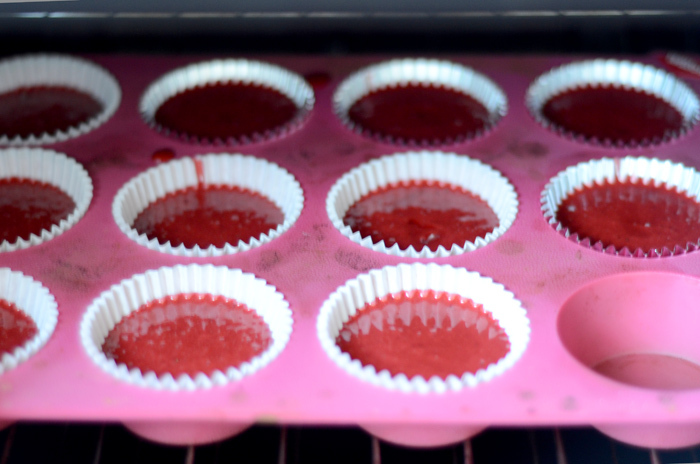 Pour the batter into cupcake cases, 2/3 of the way for a regular cupcake or 3/4 of the way if you want to fill them. Bake for 15-20 minutes, or until a skewer comes out clean. Here they are straight out of the oven. 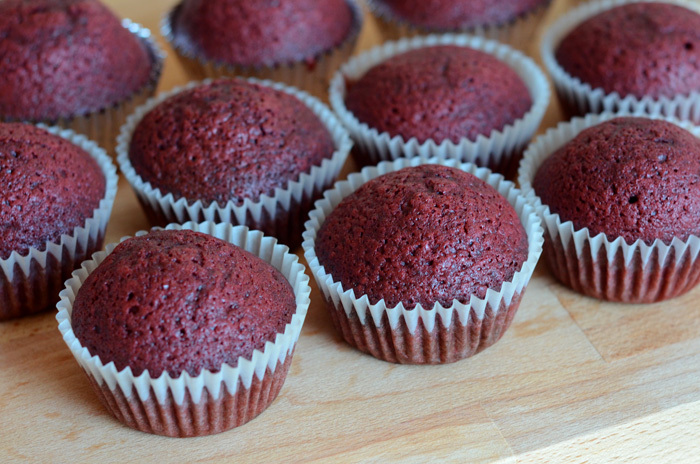 Allow them to cool at least 45–60 minutes before attempting to ice them. 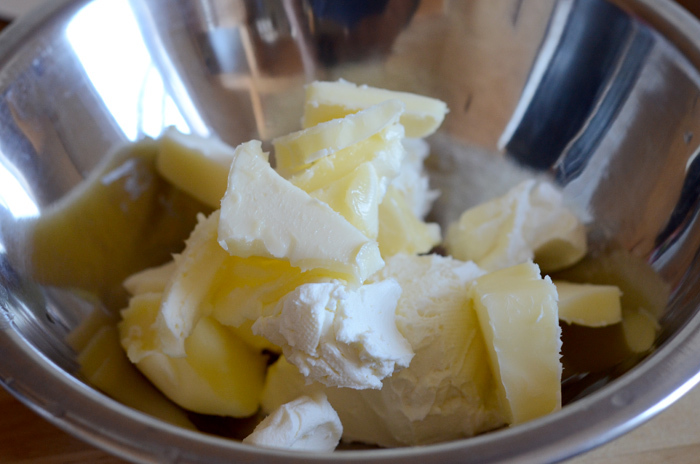 Leave the butter and cream cheese to soften to room temperature. 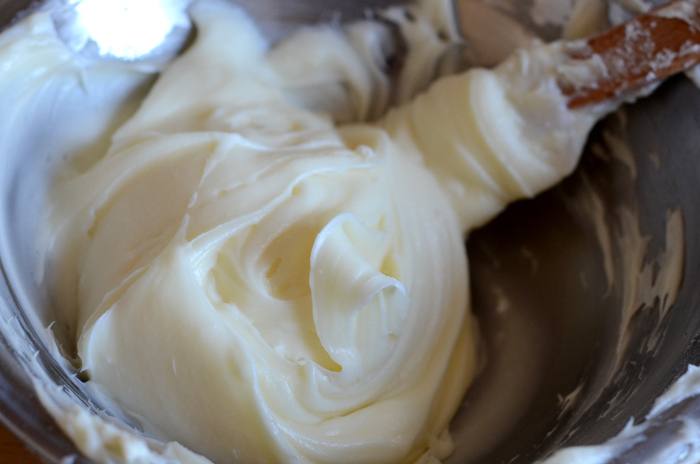 To make the icing, mix together the butter and cream cheese until creamy and well combined. 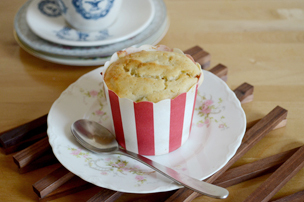 Add in the icing sugar in 2-3 batches and whip to make it fluffier. 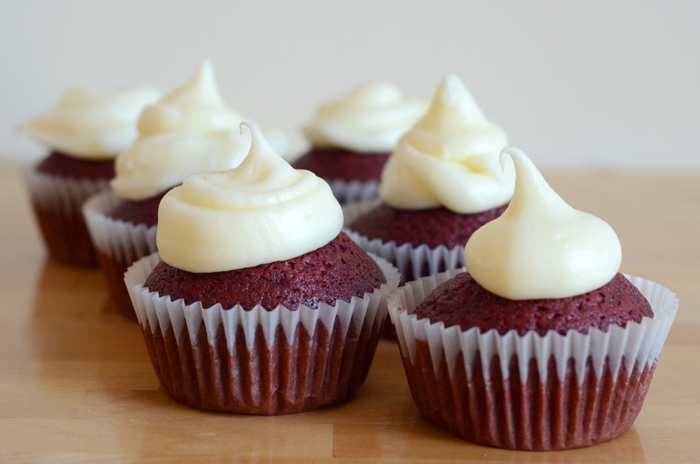 Cream cheese frosting is a little softer than buttercream, so I wanted them to look a little more freeform. I used a piping bag without a tip. 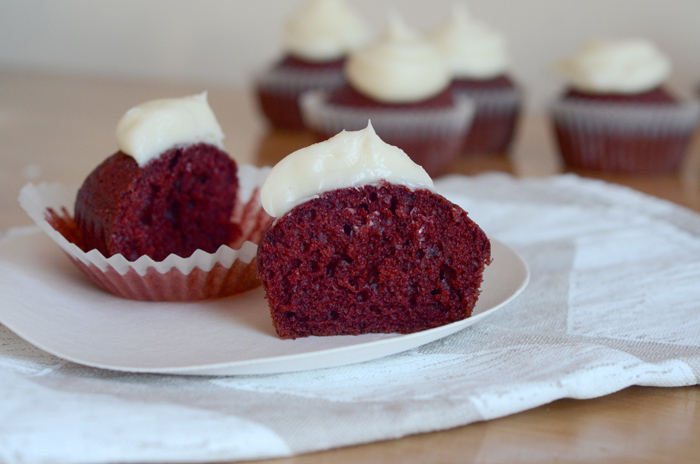 The outsides are more of a dark burgundy color, but inside they are definitely red velvet! Beautiful paper plates by Wasara. I sliced the tops and filled a few with icing this way so that they travel better.